The 400,000 square mile Patagonia region encompasses the vast southernmost tip of South America and is shared by Argentina and Chile. The Argentine side features arid steppes, grasslands and deserts, and the pinnacles of Monte Fitz Roy and Perito Moreno Glacier in its Los Glaciares National Park. The Chilean side offers glacial fjords and a temperate rainforest in its Torres del Paine National Park. The Chilean Patagonia is a collage of islands, inlets, and labyrinthine channels. Torres del Paine National Park (Chile) – one of the largest and most visited parks in Chilean Patagonia. The park is an extremely popular hiking destination with many marked paths dominated by the Paine massif that rises dramatically over the landscape. Grey Glacier calves huge, intensely colored icebergs into Lago Grey. Explore pristine landscapes that once were home to the prehistoric horse, the giant sloth and the saber-tooth tiger. Today the abundance of wildlife includes guanacos, flamingos, and condors. A UNESCO World Biosphere Reserve. 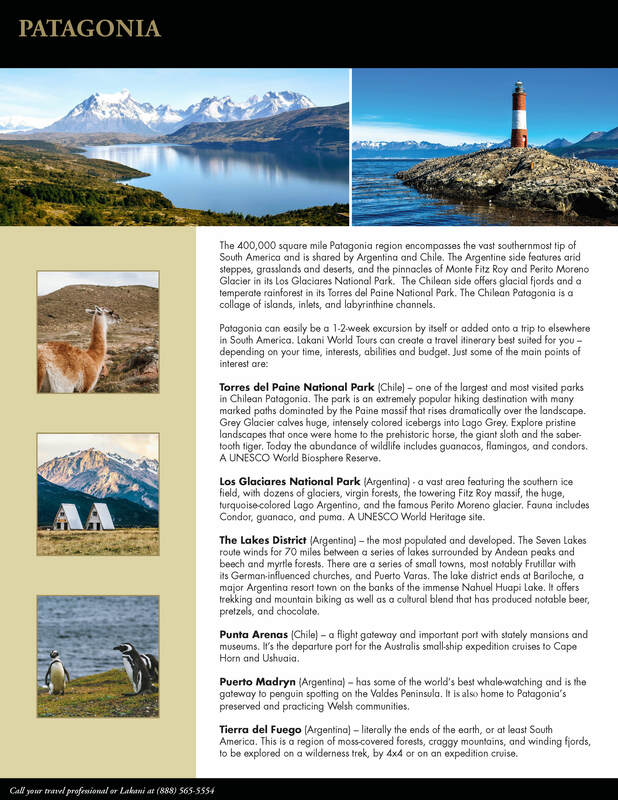 Los Glaciares National Park (Argentina) – a vast area featuring the southern ice field, with dozens of glaciers, virgin forests, the towering Fitz Roy massif, the huge, turquoise-colored Lago Argentino, and the famous Perito Moreno glacier. Fauna includes Condor, guanaco, and puma. A UNESCO World Heritage site. The Lakes District (Argentina) – the most populated and developed. The Seven Lakes route winds for 70 miles between a series of lakes surrounded by Andean peaks and beech and myrtle forests. There are a series of small towns, most notably Frutillar with its German-influenced churches, and Puerto Varas. The lake district ends at Bariloche, a major Argentina resort town on the banks of the immense Nahuel Huapi Lake. It offers trekking and mountain biking as well as a cultural blend that has produced notable beer, pretzels, and chocolate. Punta Arenas (Chile) – a flight gateway and important port with stately mansions and museums. It’s the departure port for the Australis small-ship expedition cruises to Cape Horn and Ushuaia. Puerto Madryn (Argentina) – has some of the world’s best whale-watching and is the gateway to penguin spotting on the Valdes Peninsula. It home to Patagonia’s preserved and practicing Welsh communities. Tierra del Fuego (Argentina) – literally the ends of the earth, or at least South America. This is a region of moss-covered forests, craggy mountains, and winding fjords, to be explored on a wilderness trek, by 4×4 or on an expedition cruise.